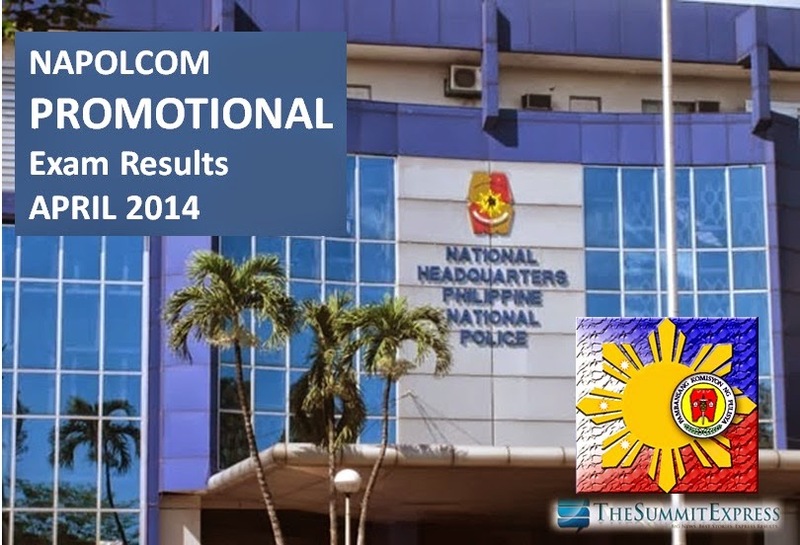 The National Police Commission (NAPOLCOM) released today, June 7, 2014 the results of Promotional examination conducted on April 27, 2014. List of passers for Superintendent, Police Inspector, Senior Police Officer and Police Officer are available on this webpage. NAPOLCOM Vice-Chairman and Executive Officer Eduardo U. Escueta announced that the Commission released the partial list of successful examinees in the PNP Entrance and Promotional Examinations [Police Officer (PO) and Senior Police Officer (SPO) categories only]. Escueta said that out of the 10,673 who took the PO Exam, only 2,084 (26.27%) passed while 1,742 (20.82%) out of the 8,367 examinees successfuly hurdled the SPO Exam. Note that NAPOLCOM said that the results of the Police Inspector and Police Superintendent exam categories shall be released next week. “The immediate release of the results of police exams is in consonance with the Commission’s commitment with the PNP and the Department of Budget and Management (DBM) to make the examination results in synch with the police recruitment process,” Escueta said. Vice-Chairman Escueta reiterates the Commission’s earlier warning for applicants of the PNP Entrance and Promotional Examinations not to commit any form of examination irregularity, such as cheating, impersonation, perjury or violation of examination rules, since the NAPOLCOM has a computer system that keeps track of the answer patterns of examinees. April 2014 NAPOLCOM exam covers the qualifying examinations for Police Officer I and the promotional examinations for Police Officers 2 and 3; Senior Police Officer (for SPO1 to SPO4); Police Inspector (for Inspector and Senior Inspector); and Police Superintendent (for Chief Inspector and Superintendent).